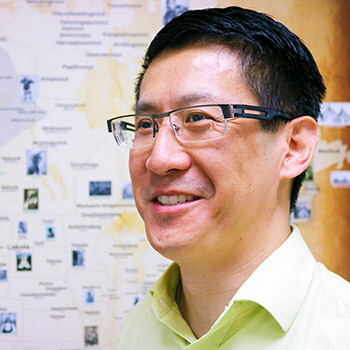 Paul Ling has one of the coolest business cards around – the Bachelor of Education candidate at Wilfrid Laurier University is a National Geographic certified educator. The professional development program is designed for elementary- and secondary-school teachers that are committed to inspiring their students to explore, conserve and change the world. The program is offered at no charge. It took six months of intense training to earn the certification that Ling says gives him new tools he can readily use in the classroom. It also brought back the sense of wonder he felt as a child leafing through the pages of National Geographic magazines. With advances in technology, National Geographic can bring Ling’s students even closer to world wonders. “When students read about the Galapagos Islands, for example, I can use video to connect with someone who’s been there,” says Ling. In addition to the teaching materials made available by National Geographic, Ling is now part of a community of about 3,000 other educators with the same certification. “If you’re developing a lesson plan and you post a question online about it, you have people from Arizona or Texas helping you, often within minutes,” says Ling. It is not a coincidence that Ling interacts with American educators; most teachers who possess National Geographic’s educator certification are from the U.S. Ling says few Canadian teachers are certified. National Geographic is working to expand the program to include educators who teach kindergarten through grade 12 worldwide. Ling is one of 15 international educators chosen to go to Washington, D.C. to be part of a committee discussing lesson plan ideas and teaching techniques for students from different backgrounds. “They like that I can speak French,” says Ling, adding that National Geographic’s educator program is as much about curiosity as it is geography. Many of National Geographic’s lesson plans are practical and interactive, something that Ling and his students enjoy. Last year, while teaching at a school in Aurora, Ont., Ling took his grade 7 students outside to build their own sextants, hand-held instruments used to measure the angle between the horizon and the stars. “If my see the device a historical video, they will have some context for what they are watching,” says Ling. Ling hopes more Canadian educators pursue the National Geographic certification.